Stilton celebrate their Hunts Intermediate Cup success last season. Last season’s Hunts Senior Cup runners-up Yaxley face a tough first round tie in this season’s competition. They have been drawn at home to favourites St Neots Town. Holders Godmanchester Rovers, who beat Yaxley 3-0 in last year’s final, are at home to Huntingdon Town. St Ives Town receive a bye to Round 2. 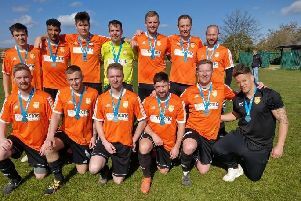 Hunts Intermediate Cup holders Stilton United begin the defence of that trophy with a home tie against Bluntisham Rangers.